BYU’s Felipe de Brito Ferreira, Long Beach State’s Kyle Ensing, Belmont Abbey’s Liam Maxwell, Grand Canyon’s Alex Shmelev, Lewis’ Michael Simmons and Hawai’i’s Joe Worsley were selected on Monday for the Off the Block National Position Player of the Week Awards. Worsley guided No. 2/2 Hawai’i to a .609 attack percentage while adding both a team-high two aces and five digs in a sweep against No. 12 CSUN on Friday. The setter also led the Rainbow Warriors to a .500 attack percentage in a three-game victory versus the Matadors on Saturday to complete the two-match series sweep. Ensing finished with a season-high 27 kills on a .471 attack percentage and contributed three aces to help No. 1/1 Long Beach State rally from a one-game deficit to beat No. 3/3 UC Santa Barbara in five games on Thursday. He also had 13 kills to go along with four blocks in the 49ers’ four-game road win against Gauchos on Friday that completed the sweep of the home-and-home series. Maxwell led all players with both a season-high 22 kills on a .333 attack percentage and 16 digs as Belmont Abbey beat its in-state rival Queens in four games on Wednesday. He also had a match-high 19 kills in a three-game conference loss to King on Friday. de Brito Ferreira led all players with a career-high 13 blocks as No. 9/9 BYU upset No. 6/6 Pepperdine in four games on Saturday. He also had nine kills on a .533 attack percentage and three blocks while helping BYU rally from a two-game deficit to upset No. 4/4 UCLA in five games on Thursday. Shmelev finished with nine kills on a .438 attack percentage and added three blocks to help Grand Canyon upset No. 10/10 USC in four games on Thursday. The middle attacker also had both a combined 10 blocks and 17 kills while hitting more than .500 as Grand Canyon split a two-match series against No. 14 George Mason during the weekend. Simmons had a match-high 13 digs as No. 7/7 Lewis beat No. 11/10 Loyola in four games on Friday. 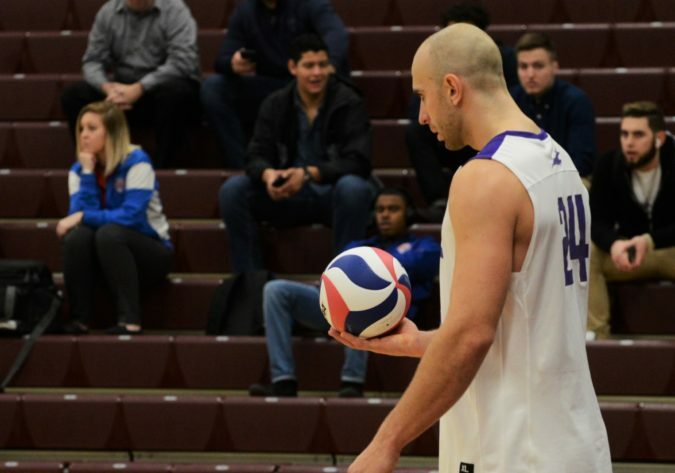 The libero also did not commit an error on 24 service receptions in the victory that extended the Flyers’ first-place led in the MIVA to two matches.